Accuweigh recently supplied two sets of platform scales to SP Hay, one of the Australia’s largest exporters of hay to Japan. Both Avery A500 galvanised platform scales are used to weigh hay as it is filled into bulka-bags. 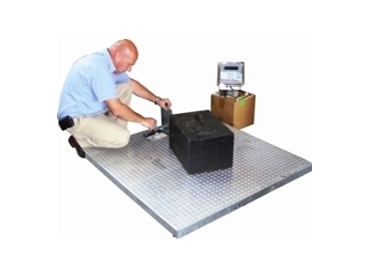 To improve cost effectiveness, both platform scales are connected to a single digital weight indicator. SP Hay purchased two platform scales (measuring 1200mm x 1200mm) and fitted their own metal framework to hold the bulka bags in position. The single Rinstrum 5100 batching indicator is connected to both platform scales and the operator uses a simple switch to connect the platform scale the hay is to be loaded onto while the filled bag is being removed. Accuweigh has fully completed batching controllers available, but in this case, the client fitted their own external start and stop buttons and the relays required to operate the feed mechanism for controlling the hay being fed onto the platform scales.